We awoke in the magical Walmart car park of Newton, OK. That isn't to say the car park was magical, but the Walmart. For this was the Walmart where Cheesey bread was to be found. The original. The best. The stodgiest. And lo, for there was much rejoicing. The setup today was complicated. We thought so. The SPC thought so, and no chasers (including us) seemed to know what to do. We decided to head for the Oklahoma / Arkansas border where it seemed that the best conditions existed for supercells. It appeared there would be storms in various places today, but this area seemed to have the best conditions for the types of storms we wanted. One particular thing we wanted were lower LCLs (lifted condensation levels) - this is basically a function of moisture and temperature that determines the altitude at which clouds will start forming. The lower they are, the more epic the storms tend to be. It seemed that our target area was the best for that, along with a few other preferable parameters - I won' t bore you even more with further details. We drove somewhat tentatively as we were heading out of the SPCs tornado risk area, which always feels a little wrong - although we're gaining confidence in going against them a bit more the more we chase. After a couple of hours some storms fired in southeast Oklahoma, drifting into Arkansas. 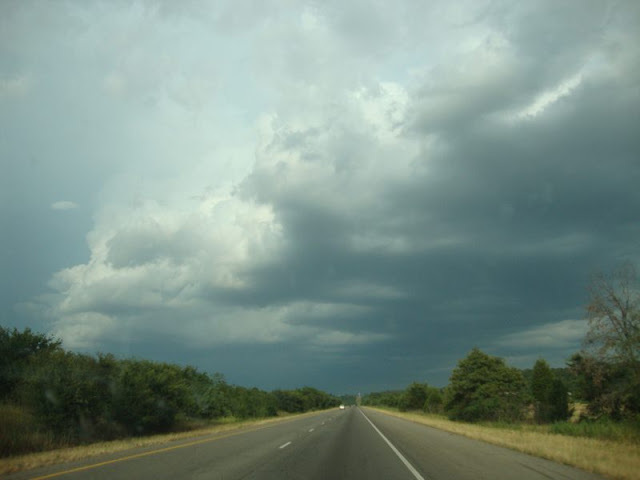 This was the initiation we were waiting for and so we picked up our pace and headed through the Arkansas border. What we found in Arkansas was about 1 road. It was an impressive road, carving a massive concrete scar across a rather beautiful region of mountainous forests. A leading storm had passed through not long before so evaporation in the forests gave them a good atmospheric feel. However this is about all there was to look at, we were technically on a particular storm but couldn't really see it. The base was behind hills and trees and the top was embedded in some middle atmosphere "gunk" as Cambo sensibly termed it yesterday. We eventually intercepted it at Clarkesville, Arkansas. We thought we'd just get in its path and get munched a bit, but it fizzled out about a mile before it hit us! This town seemed a bit murderville like (it reminded us a little of Wisconsin! ), indeed there was an advert for "Murders Services". I suspect they meant to put an apostrophe in there somewhere, but can't be sure. We stopped at a gas station to get a drink and found the one product that had still been eluding our travels. Some corn nuts. This seemed like a good sign to turn around and make for the state border like we were on the run. 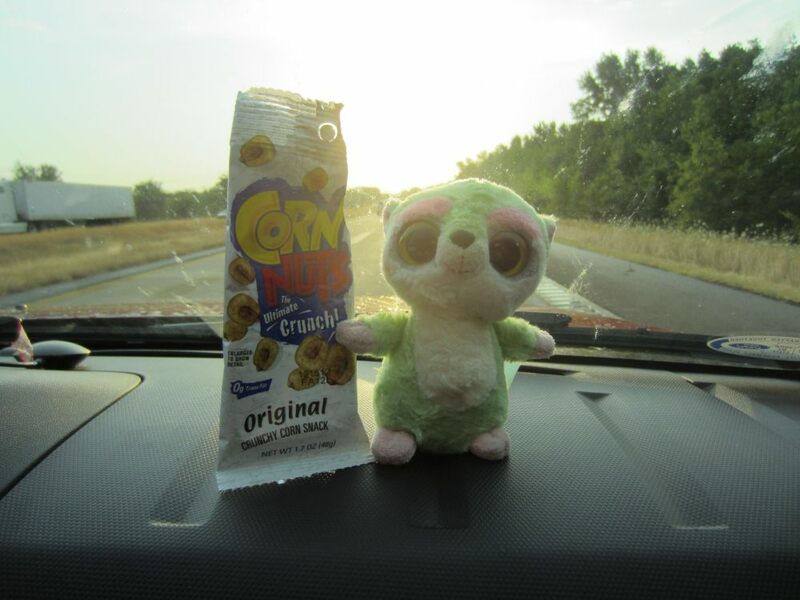 It was a nice enough journey at sunset under clear-ish skies, and Mr Pilkington seemed very happy about the corn nuts, so it wasn't a wasted 300 mile journey! We'd also learned the hard way that chasing in Arkansas is not advisable! We headed back along the I40 and once safely in Oklahoma, with no chasing looking like it was on for tomorrow (except perhaps Montana, but a 24 hour drive in 15 hours is beyond our best endeavours) we simply stopped in the first half reasonable town we found, called Sallisaw, and made camp for the night.